X 6120-4 12’ 4pc 6wt: Ideally suited for a multitude of steelhead, light salmon and big trout duty. A really good choice for the brace rod below the #8 that everyone owns. A Deschutes favorite along with a Tierra del Fuego small rod. X 7120-4 12’ 4pc 7wt: All-purpose #7 Weight for the Pacific Rim and beyond. Everything from Steelhead, Giant Rainbows to Tierra del Fuego browns are all on the menu for this stellar performer. X 7130-4 13’ 4pc 7wt: A Stealheader’s Choice, be it Oregon or Washington here’s your stick. Travel with Confidence knowing that you’re sitting in the “just right” Length and Line weight for both winter and summer endeavors. At 13’ you’ll cast distance with ease yet in the canopy it’ll still work flawlessly. Step on in, the water’s ready. X 7140-4 14’ 4pc 7wt: The casters delight 7wt has arrived. Given the popularity of the 7wt spey rod throughout the Pacific Rim it is only fitting to bring this long anticipated rod to the steelhead theater. No longer will you wonder if you could have just reached another 10’. Dial the distance and cast…summer runs beware. X 8120-4 12’ 4pc 8wt: Super tactical spey rod. From Kings in Alaska to winter runs on the Sol Duc to tight casting quarters on the North Umpqua. This is an ideal 2nd rod for winter spey enthusiasts. Don’t be fooled by the 12’ length, long casts come surprisingly easy with minimal effort. X 8130-4 13’ 4pc 8wt: From the Umpqua to the Babine this is an ideal all around spey rod as we’ve seen in years. No stone shall be unturned as you take the river step by step and ultimately by storm. In addition to steelhead this will prove a versatile 8wt from TDF to Western Alaska (Kings). X 8140-4 14’ 4pc 8wt: Big Water, BC Fall Performer. When the Skagit Re-Opens to be sure, this will be the stick you want. Never before has a rod this light weight with such stunning capability been available. Uncharted Ground will soon turn to uncharted casts as you cover runs like never before. X 9120-4 12’ 4pc 9wt: King Salmon are nervous everywhere. From Bristol Bay to Chile the King Tamer is fixing to travel, Divide and conquer. Not since 1990 going back many years has this caliber/length of Spey rod been available. Ideally suited for king salmon but equally at home in wind swept TDF this rod is soon to be the traveling angler’s close companion. X 6110-4 11’ 4pc 6wt: The all-around Northwest performer, from the beaches of Puget Sound coupled with summer run pursuits from the Rogue to the Stilly. Long overhead casts transcend to spey style techniques covering both nymph and swing fishing. The versatility of this rod will earmark this as a Northwest favorite. X 7110-4 11’ 4pc 7wt: For those in pursuit of Steelhead, outsized Sea Run Dollies, big Alaskan Rainbows along with TDF Browns this rod is a true trout/anadromous cross over, “the .30-06 of switch”. 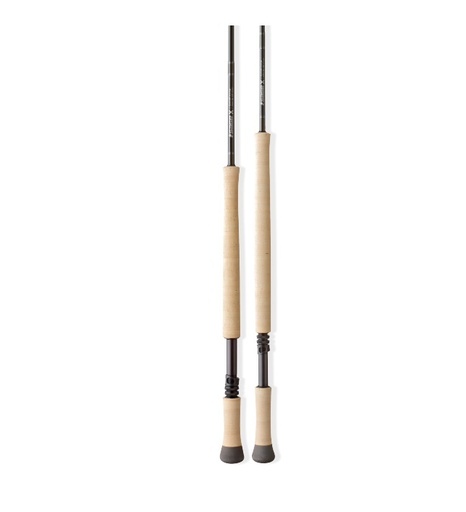 General Spey: Skagit Max Short 500, RIO Scandi 460. X 8110-4 11’ 4pc 8wt: A true Anadromous performer, the 8116-4 is ideal for Alaskan rainbows, Steelhead and Silvers alike. Couple this as a true “double threat” switch rod covering such diverse environments as Oregon’s Rogue one day and the Umpqua the next. The TDF crowd has its Sea Run Brown rod; along with a wide range summer run and Alaska cross over stick.